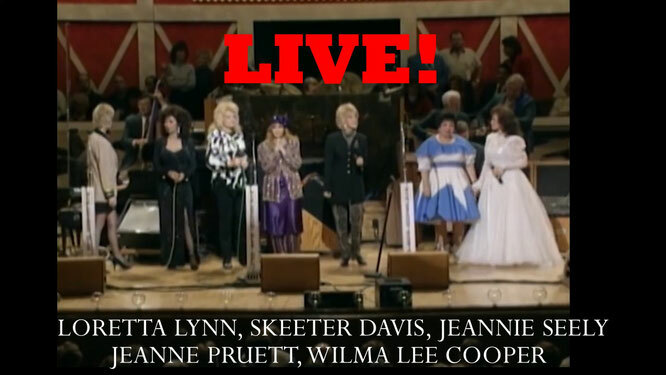 The Grand Ladies of the Grand Ole Opry Live! (1997) Full Show! - Newhillbilly website. 100% American Roots Music. Lynn has received numerous awards and other accolades for her groundbreaking role in country music, including awards from both the Country Music Association and Academy of Country Music as a duet partner and an individual artist. She is the most awarded female country recording artist and the only female ACM Artist of the Decade (1970s). Lynn, has sold more than 45 million albums worldwide, scored 24 number one hit singles, and 11 number one albums. Lynn continues to tour, appear at the Grand Old Opry and release new albums. She is recognized by the strength and quality of her voice still today, as well as her down to earth, quick wit and humor. Mary Frances Penick (December 30, 1931 – September 19, 2004), known as Skeeter Davis, was an American country music singer who sang crossover pop music songs including 1962's "The End of the World". She started out as part of the Davis Sisters as a teenager in the late 1940s, eventually landing on RCA Victor. In the late 1950s, she became a solo star. Marilyn Jeanne "Jeannie" Seely (born July 6, 1940) is an American country music singer and Grand Ole Opry star. She is best known for her 1966 Grammy award-winning country hit "Don't Touch Me", which peaked at No. 1 on the Record World and Cash Box country singles charts, and at No. 2 on Billboard. Seely has produced numerous country hits, from the 1960s into the mid-1970s, including duets with Jack Greene like 1969's "I Wish I Didn't Have to Miss You". Seely has befriended many singers, musicians and songwriters in the country music field, including Jan Howard and Dottie West. Wilma Lee Leary (February 7, 1921 – September 13, 2011), known professionally as Wilma Lee Cooper, was an American bluegrass-based country music entertainer. Born in Valley Head, West Virginia, Leary sang in her youth with her family's gospel music group, The Leary Family, which included her parents and sisters. They recorded for the Library Of Congress in 1938. Wilma was born Willma Leigh Leary, according to the 1930 US Census. In 1941, Leary married fiddler and vocalist Dale T. "Stoney" Cooper, who was a musical accompanist for the Leary Family, and the duo formed their own bluegrass group; Wilma Lee & Stoney Cooper and the Clinch Mountain Clan. They were regulars for ten years on Wheeling, West Virginia's WWVA-AM's rival to the Grand Ole Opry, WWVA Jamboree, beginning in 1947 before joining the Opry in 1957. Wilma Lee and Stoney Cooper had remarkable record success in the late 1950s and early 1960s on Hickory Records given both their bluegrass sound (which has rarely been as commercially successful) and the damage rock-n-roll was doing to country music's popularity at the time. They scored seven hit records between 1956 and 1961, with four top ten hits on Billboard charts, notably "Big Midnight Special" and "There's a Big Wheel". They remained connected to the Leary Family tradition as well, recording popular gospel songs like "The Tramp on the Street" and "Walking My Lord Up Calvary's Hill". Cooper died in 1977 but Wilma Lee stayed on the Opry as a solo star and on occasion recorded an album for a bluegrass record label. In 2001 she suffered a stroke while performing on the Opry stage which ended her career, but Cooper defied doctors who said she would never walk again and eventually returned to the Opry to greet and thank the crowds. The Cooper's daughter, Carol Lee Cooper, was the lead singer for the Grand Ole Opry's backup vocal group, The Carol Lee Singers until she announced her retirement live on the Opry on March 24, 2012. Wilma Lee Cooper died from natural causes on September 13, 2011, at her home in Sweetwater, Tennessee. She had been a member of the Opry since 1957. She was 90 years old. Her last solo performance on the Opry was at the Ryman Auditorium on February 24, 2001. Wilma Lee joined the Opry cast at the grand re-opening of the Opry House on September 28, 2010 for a group sing-along.